A reptilian body coiled in majestic poise with royal head gracefully prepared for the fatal strike. Beware the cobra, the venomous king of serpents. 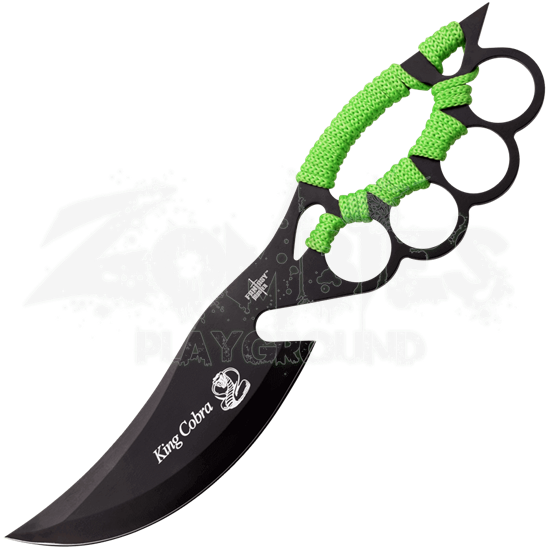 Seal the fate of the enemy with the poisonous energy of the Toxic Venom Cobra Knife. With a fixed blade knife forged of strong stainless steel from blade point to handle tip, this venomous combat knife strikes with deadly force. Built-in finger grooves allow for potent, skillful hand-coiled grip attacks. An emblem of this royal serpent majestically adorns the black painted blade. The green wrapping cord coils around and through the handle to complete the venomous theme.